This article by then Editor-in-Chief Keith R. Johnson '56 appeared in the September 20, 1955, edition of the Sun. 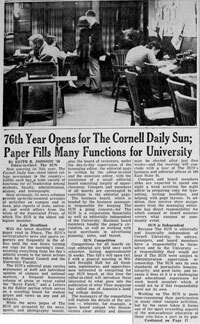 Keith R. Johnson '56, a former Cornell Daily Sun editor-in-chief, has made a major gift to the Cornell University Library in support of the Sun digitization project. Johnson's gift will allow the Library to digitize all of the remaining early volumes through 1930–31. In recognition of his generosity, the online archive has been named the "Keith R. Johnson '56 Cornell Daily Sun Archive."